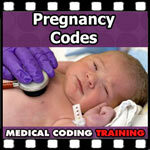 Medical coding for pregnancy. I really like this because this is one of the most common questions that I get when I’m teaching. Pregnancy can be really intimidating because there’s so many codes that are involved. One of our PBC students had stated, “How many pregnancy codes do I need when I code a pregnancy and delivery? This continues to confuse me. I think I have all of them and when I check my answer, I’ve missed one.” And if you click on that answer, I’ve got a scenario that’s actually in the Carol Buck book that covers several. When you’re dealing with pregnancy coding, the first thing you need to determine, “the mother’s chart or the baby’s chart?”. Now, with pregnancy coding, you would be thinking, “Okay well, pregnancy isn’t the baby.” But as long as the mother is pregnant and has not delivered, everything that happens to the fetus or the mother is put on the mother’s chart. Then once the baby is delivered, you have a newborn chart and things get separated. That can confuse people sometimes, as well, so make sure you’re in the proper chart. Some of the key terms that you want to look for when you go to code pregnancy: gestation, cesarean delivery, vaginal delivery and if it was a viable or a living infant. You’ll see both those terms. Okay, this is one from the textbook that we use, the Carol Buck books that we like so well, the Step by Step. Mrs. Smith is a 32-week gestation… and I highlighted all the terms that you’re going to pull out of this… and is admitted with a severe bleeding and abdominal cramping. An emergency ultrasound is done and fetal monitors are applied. She’s diagnosed with total placenta previa with indications of fetal distress. An emergency cesarean section is done with delivery of a viable, male infant. So I broke down the codes that you would use for this. This is actually in the ICD-9 section of our book but I went ahead and pulled out a CPT code. And when you’re doing CPT codes for delivery, it’s a cesarean delivery only. You’ll also find codes for CPT where your patient tried to deliver vaginally and was not able to and so then they reverted to a cesarean delivery or they went in as cesarean initially. Those are things you want to pay attention to. So your ICD-9 codes, we’ll just start at the very beginning. So we have a pregnant patient and it’s complicated because there’s a problem. Whenever you see any type of a problem then that’s a red flag. And the term you’re going to look up is complication or complicated. What did she have that was complicated? She had a problem with her placenta. What was it? It was placenta previa. So that code, 641.11 is the code that we’re going to use first. That’s why she was brought in because she had a complication with the pregnancy. The bleeding, all of that, or the signs and symptoms of the placenta previa, so you don’t code those. Now what did this result in? We have distress of the fetus so you look up distress. Of what? The fetus and it’s affecting the management of the pregnancy. How is it affecting the management of the pregnancy is that we’re going to have to deliver. Placenta previa is a danger to both the baby and the mama. You’ll bleed out and you’ll bleed out very quickly so that could result in death of both the mother and the baby. It’s something that they have to take care of quickly. So it affected the management of the pregnancy. That’s what’s going to be coded next. You notice as we’re going along, we’re painting a picture and we’re just… we’re giving a description of each step of what’s going on with the mama. Now our last thing that happens is we have a viable male infant. It doesn’t matter if it’s male or female. That’s not a coding thing that you need to worry about. But knowing how many is delivered and stuff is important. This is the V code. All pregnancies with deliveries end up with a V code. Don’t leave those off so when you’re taking your CPC exam, you may see all of these codes on there. You think, “Okay, I’ve got it but they left the V code off.” And so that’s a heads up. Don’t leave the V code off. What do you have? The outcome is the term you look up. Outcome of delivery, single and then liveborn because you have stillborn babies and that’s a separate code. So everything turned out fine. We have the outcome. We had one baby that was born and the baby was born live. That’s where you get the viable. And that’s how you do pregnancy codes when you have complications. You just go from the beginning to the end, step by step, kind of in order as they happen and make sure that you get everything that’s listed. Thanks Laureen. Brilliantly explained. Is there a code that may cause a confusion whether the procedure happened to the mother or to the infant?